Stunning clusters of violet blue funnel-shaped flowers in April. This lovely plant has good shiny green winter's particularly hardy and easy to grow. Height 60-80cm in 10 years. 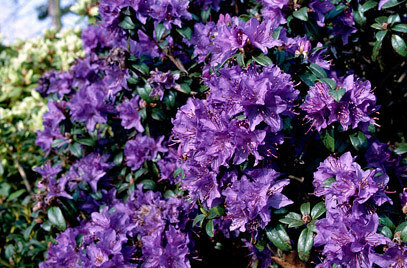 Dwarf Rhododendrons don't mind the sun but they hate too much heat, so do avoid reflected heat from South facing walls and patios, particularly if planting in containers. We love this plant and think it is one the best blue varieties.